On this website, you will find analytical balances which support highly accurate measurement. Analytical Balances with software and the possibility to measure to an accuracy of 0.01 mg The precision reaches up to 0.01 mg. If you need more accurate balances, they can also be requested. Our analytical balances can be calibrated, delivered with calibration weights or purchased with optional windscreen made of plastic. Thanks to interfaces as the RS-232 interface and optional software, data transfer and further analysis is enabled. Our analytical balances support different functions as for example the automatic adjustment of weight, piece counting, ISO GLP protocol or tare-function. Moreover, many analytical balances come with mains adaptor. Analytical balances can be ISO calibrated and can therefore be applied in laboratories, industrial production and quality assurance. The Analytical Balance PCE-BS 3000 is a light, rugged precision balance suitable for different purposes. The removable stainless steel pan allows the laboratory balance to be cleaned easily. The Analytical Balance PCE-BS 3000 can be used for weighing as well as for piece counting. The Analytical Balance PCE-BS 300 is a light, rugged precision balance suitable for different purposes. The removable stainless steel pan allows the laboratory balance to be cleaned easily. 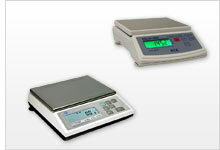 The Analytical Balance PCE-BS 300 can be used for weighing as well as for piece counting. Analytical Balance PCE-BT 200 to be used in Laboratories, production, quality controls, etc. Some important aspects of the Analytical Balance are both its design consisting on a flat surface and also it is very easy to use. Analytical Balance PCE-BT 2000 to be used in Laboratories, production, quality controls, etc. Some important aspects of the Analytical Balance are both its design consisting on a flat surface and also it is very easy to use. The basis weight Analytical Balance directly shows the result in g/m² with high resolution (0.1 g/m²) / the weighing unit can be changed to grams by pushing one button only. PCE-MA 110 is an analytical balance or halogen moisture analyzer that functions on the gravimetric or loss on drying (LOD) principle. The moisture analyzer uses the halogen method to dry the material sample. Moisture content is calculated based on the weight difference before and after the drying procedure. Calibration of the moisture analyzer can be performed at any time using the automatic calibration function and the included 100 g weight. This Analytical Balance gets stable stand from its die cast aluminum housing. The glass weighing chamber of the Analytical Balance avoids wind influences. The PCE-MA 202 is an oven-drying analytical balance for weighing and heating material samples to determine moisture content. The heating chamber warms up to 199 °C / 390 °F with the use of halogen lamps. Drying of the sample to be weighed takes place within the chamber of the analytical balance and the moisture content is subsequently calculated from the difference between the initial and final weight. The analytical balance PCE-MA 100 allows different materials to be weighed and their moisture contents determined. The heating chamber is heated by halogen lamps up to 199 °C. In this chamber, the analytical balance dries the material to be weighed, and then calculates the moisture content from the weight difference. The analytical balance PCE-MA 200 is used to weigh a range of substances up to 200g / 7.05oz and measure their moisture content. A halogen lamp heats up the chamber to 199 °C / 390 °F. The analytical balance dries the substance to be weighed within the heating chamber and determines the moisture content from the difference in weight. The analytical balance PCE-MA 50X is an innovative solution for the fast and highly accurate determination of moisture in a wide variety of materials. The precision weighing scale uses weighing technology from the analytical balance range and is operated in combination with a drying chamber.